In fact, community banks enhance the chances for survival of start-up companies, and by extension, the higher rates of employment growth and job creation that are indicative of newer firms. One key characteristic of community banks that make them so valuable to local communities, and so different from larger banks, is the community bank relationship-business model. Community banks serve local economies by tailoring their loans and financial services around the customers within their geographically limited markets. Conversely, the largest banks leverage economies of scale and the law of numbers in order to offer standardized mortgage and consumer products across a diversity of U.S. and global markets. Despite continued industry consolidation and increased competition, community banks continue to play an especially large role in providing credit to small businesses and farms, holding nearly 45 percent of the banking industry’s small loans to farms and businesses. 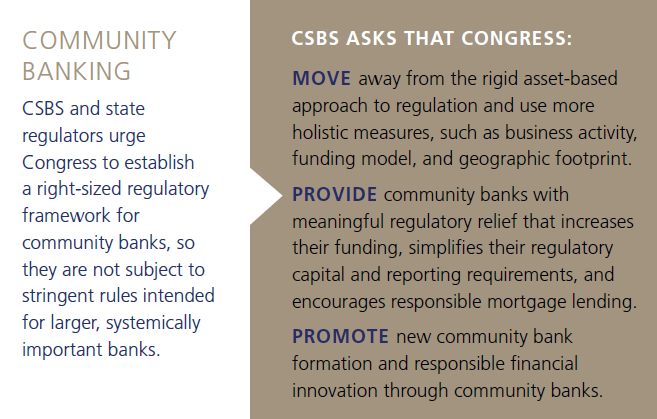 Community banks play a critical role in providing credit to rural communities. According to the FDIC, one in five counties in the United States would not have a single bank branch if it were not for a community bank. And, according to research from the Community Banking in the 21st Century Research Conference, local community banks are comparatively more likely to provide credit to rural communities during an economic downturn. This map displays banking branches by size of bank. disproportionately provide services to rural and suburban communities.